Welcome to the 3rd edition of the Taylor Joelle Children’s Style Guide. Every Monday we post new children’s fashion looks put together by the designer and founder of Taylor Joelle Designs, Jenny. If you are looking for the perfect look for your child for a photo shoot, a holiday, a special occasion (or just because it’s Monday), you have come to the right place! We know that you’ll be inspired! This week’s look is for the boys! We know that it can be hard to dress a little boy. It seems that all of the “cute” stuff is for the girls. Taylor Joelle strives to have options for your boys to have great fashion too. 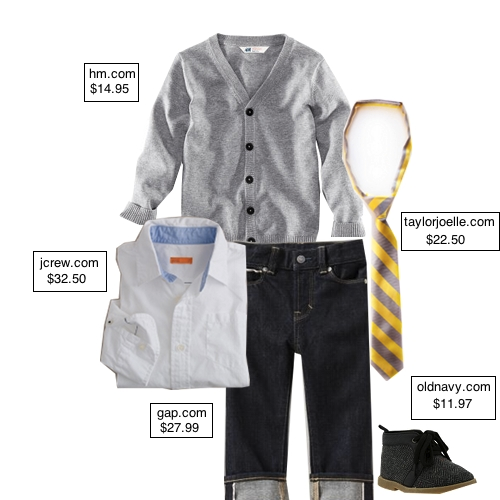 Your little man will look classy and fun in this look. Start the look with this white button up shirt from Jcrew.com and cardigan from hm.com. Dress it up with this grey and yellow skinny tie from taylorjoelle.com. Add the finishing touch with straight cuffed jeans from gap.com and Herrigton boots from oldnavy.com. Be sure to follow our blog via email and/or Google Friend Connect (right side bar) to be inspired by our Children’s Style Guide every Monday! Stay tuned!